The Street Food concept has been doing the rounds for some years and has been growing in popularity. In Cape Town, most of it has been in the form of home based vendors who only serve on specific days, creating cult followings who wait loyally for their weekly fix. Some major franchises like Rocomamas have cottoned on to this trend and created sit down eateries where you can enjoy the messy hands concept in a restaurant environment. A halaal option in Cape Town has been elusive though. Besides Woodies at the V&A who pioneered this trend. Along comes Brocka, with their slick urban streetstyle look and feel designed by the acclaimed Industrial designer Aiden Bennetts, their exciting on trend menu and an everyday accessibility for breakfast, lunch and supper in a sit down venue in the centrally located Canal Walk Mall. Their unique venue is unmissable at the Pick n Pay entrance of the mall. The container in a warehouse concept with the name in huge billboard lights above it make for an eye-catching entrance. The interior is atmospheric, with a unique blend of rustic and ultra-modern finishes. An indoor laser cut pergola, copper-hued Tolix chairs, exposed brickwork, and homespun table elements, contribute to an urban decay feel. The concept is not that of a full restaurant. You order you meal at the counter and take a seat if you’re eating in. Your food will be brought to your table in rustic Brockafied wooden trays. Burgers are wrapped in branded paper and ribs, wings and fries are served in disposable cardboard containers. Cutlery is also of the disposable wooden variety. It almost feels a bit like a roadhouse concept. There are no waiters taking orders, just servers who will bring you your order. We started with the ribs which was sweet and sticky as expected, tender and falling off the bone. The wings were ok, good flavor but not pre-fried or sticky enough for me. I felt like they needed more texture. Then came the Veteran burger which is their basic burger that comes with a hand pressed Beef patty and BBQ sauce. All burgers are served with mayo, lettuce, onion, tomato and pickles on a brioche bun. I like the brioche bun because it adds an extra level of flavor to the burger. I found this burger tasty but too messy for me. Next time I won’t unwrap it completely. It might be easier to eat if you unwrap as you go along. The Mexican Fest burger was flavour packed with the addition of 3 chilli poppers, chilli sauce and avo. The chilli poppers on the burger were an innovative touch. Loved it. These came with rustic hand cut fries which were also very good. Of the sweet dishes on offer there was the Rocky Road waffle with chocolate, marshmallow, caramel and nuts which was good as well as the Usual Suspect with maple syrup, banana and nuts both served with cream. These came with a popcorn milkshake known as the “Gold Digger”. While I usually find caramel flavoured anything too sweet for me, I found this milkshake to be just right. The popcorn added crunch and the flake was an old school but welcome chocolatey touch. Prices are a bit on the higher end of the scale and ranges from R59 for the Veteran burger only to R79 for a combo with fries and soda. The Mexican came in at R89 for the burger only. Ribs at R99 for 400g (no fries), and wings at R69 for 400g. Waffles start at R49, shakes from R39 to R59. Kids could be accomodated by the Munchies section on the menu that has smaller burgers, loaded fries and a quesadilla. They have some vegetarian options on the menu, but make no mistake, Brocka is aimed at meat eaters. Breakfast options are available as well as a small coffee menu. 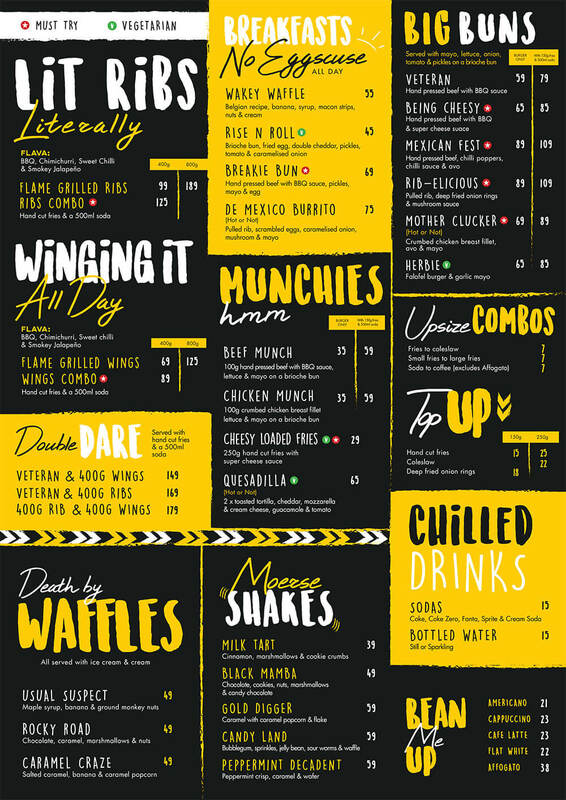 There’s still lots to try on this menu and I’m going back real soon for them cheesy loaded fries…..
Not impressed at all. I can get a better burger and chips and steers or nandos for cheaper. The cost is too high. What happened to the old fashioned cheese slice? Chips drenched in oil and extremely small portion. No knife and fork provided. When we got it was plastic. Surely if they want to do a cheap throw away they could do a little more effort. Overall NOT worth the cost honestly. Poor service, horrendous order and seating process. You order at the tellers before being seated which you then find on your own, which we did not, and we already paid so no choice but to wait. If you want anything after that you need to go back in the queue and wait to place the order and pay upfront again. This is a takeaways not diner or restaurant as we were made to believe. It was really good. Love the rib burger. Definitely coming back.